Denis Dubourdieu is all at once a scientist, a vineyard owner and a wine maker. Educated as an agronomist, an Œnology Professor at the University of Bordeaux since 1987, he has concentrated his research studies on yeasts, aromas and colloids. He is considered as one of the top specialist in the winemaking process and the ageing of white wines. 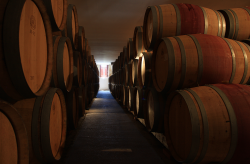 Nevertheless the work of his team has also greatly contributed to deepening our knowledge of red wines aromas. Simultaneously, Denis Dubourdieu runs the family vineyards. He is also a consultant to numerous wine producers in France and abroad. The great purity of aromas that marks his style can be detected in his wines. The whites (dry or sweet), with a bursting fruit aroma, are slender and mineral; they combine power and freshness in an infinite youth. The reds, deeply coloured, are plenty of fruit and spices; they blend with perfect harmony sweetness of the taste with the fullness and depth of silky and refreshing tannins. Although irresistible while young, their longevity is astonishing.